Kylie Jenner is reeling over the realization that best friend Jordyn Woods betrayed her friendship by hooking up with Khloe Kardashian's former beau, Tristan Thompson. While news of Tristan cheating on the mother of his child isn't a surprise to the world, people are shocked to learn that the mistress is a close confidante of Kylie. This is perhaps most surprising to the Kardashian family, who have been close friends with the aspiring model for much of her life. However, this scandal marks the end of a friendship that spans well over a decade. A source tells E! News, "The whole family is writing Jordyn off." Cutting ties with the 21-year-old is going to be hardest for Kylie, who, according to a source, "was in denial for days." The makeup mogul "is very torn on how to handle the situation," and for good reason. Kylie fondly refers to Woods as Auntie Jordyn and reportedly lets her friend live in in her guest house. Similarly, True's mom is in utter "disbelief" over the sordid situation. 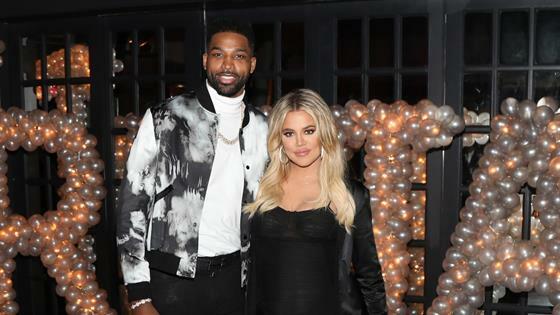 "Khloe is more disappointed that someone so close to their family would betray her," the source explains. "She can't believe it." According to the insider, the Good American founder learned about Tristan's tryst with the 21-year-old through a mutual friend on Monday. She then confronted the athlete about the rumors, which a second source says Tristan "tried to deny." Khloe wasn't hearing it though. "She heard it from multiple people and doesn't believe him for a second," the second source adds. "She is angry more than she is sad. And she's shocked Jordyn would do this. Of all the guys in the world, she can't fathom why Jordyn would make a decision like this," the second source explains. "Khloe is reliving the worst kind of betrayal and pain all over again." However, the 34-year-old appeared to be in good spirits when she stepped out on Tuesday afternoon, around the time that news of the betrayal broke. It appears that Tristan's most recent infidelity has shown the star that "she deserves better." The second source explains, "She is done." As for the night of the betrayal, the first source shares that Tristan and Jordyn were spotted looking too close for comfort when they went with a "group with mutual friends" to see rapper Drake and his crew. While mingling with their friends, the source says, "Tristan and Jordyn were definitely hanging close to one another and were being very flirty." "Tristan had his arms around her at one point," the insider adds. As the night went on, the source says, "Jordyn stood by him the entire time they were out and he was laughing and smiling at her." Things quickly escalated between the two A-listers when Tristan invited their friends and Jordyn back to his place for a "secretive" after party. "Jordyn stayed at Tristan's house partying with him and his friends until the early hours of the morning, and they were very touchy," the source shares. "They sat together on the couch and were talking and cuddling for hours." "They had chemistry the entire night and everyone could see it... You could tell they were into each other," the insider describes. Jordyn has yet to address the accusations.